What does 100 bucks look like? From left to right, a standard platinum plug for my car, CR8HIX, R0045J, CM-6, R847, and ME-8. All of them except the first are NGK. All of the interesting NGK plugs are racing plugs and run about $25 each. The ME-8 has a 1/4-32 thread and is TINY. It is basically the same size as an R/C glow plug. In general, it looks way too fragile and still costs twenty bucks. I'll be trying the R847 next. As you can see in the photo, the NGK surface gap plug is holding up well. This is the first plug of its type I've used and you can see that it looks basically untouched after 30 firings or so. I did some more testing of the igniter. As it turns out, it appears to have been running extremely rich before. I leaned it out some to get smoother operation and there is a big difference in the metal temperature. At the previous mixture ratio, the steel never glowed red. Over the last couple of months, I've been testing direct spark ignition of my NOP engine. It works, but it can be flakey, and usually makes a rather disconcerting "pop" at ignition. I also tried RC glow plugs, but with standard currents and voltages, they don't provide enough power (i.e. heat to the coil). I think that with PWM you could control or set the power level to get the right wire temperature but that's a rabbit hole I didn't want to go down right now. So, I finally decided to build a torch igniter. I've been testing various plumbing configurations, spark plugs, and orifice sizes and I think I've arrived at something that works fairly well. It accepts liquids for both oxidizer and fuel, which is nice. 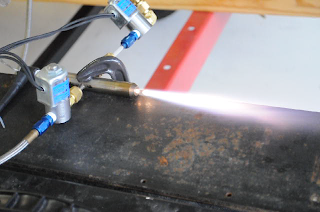 I'm not sure if other's torch igniters run on on gaseous oxidizer or not. The next step is to weld it onto the motor.